Typewritten Letter Signed, one page, quarto, April 7, 1932. 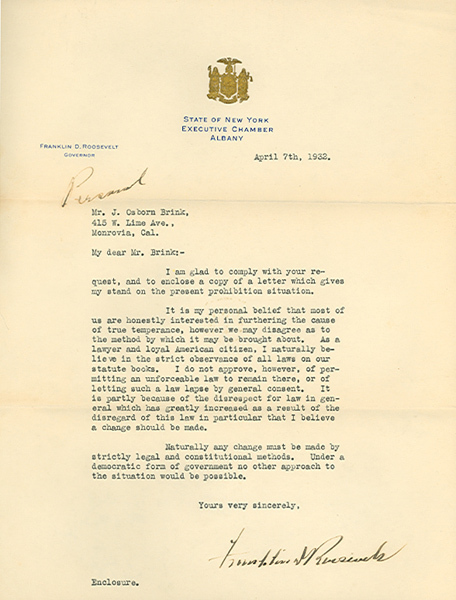 On his name-imprinted State of New York Executive Chamber stationery, to Mr. J. Osborn Brink in Monrovia, California. Headed “Personal” at the top in Franklin D Roosevelt’s hand. With original envelope and a letter from Roosevelt to U.S. Senator Robert F. Wagner, dated September 9, 1930, which gives his stand on the present prohibition situation. “I am glad to comply with your request, and to enclose a copy of a letter which gives my stand on the present prohibition situation. “It is my personal belief that most of us are honestly interested in furthering the cause of true temperance, however we may disagree as to the method by which it may be brought about. As a lawyer and loyal American citizen, I naturally believe in the strict observance of all laws on our statute books. I do not approve, however, of permitting an unforceable law to remain there, or of letting such a law lapse by general consent. It is partly because of the disrespect for law in general which has greatly increased as a result of the disregard of this law in particular that I believe a change should be made. This letter was written while Franklin D Roosevelt was campaigning for President. He was elected seven months later, assuring the end of Prohibition. In February 1933 Congress adopted a resolution proposing the Twenty-first Amendment to the Constitution to repeal the Eighteenth. It was passed on December 5, 1933.